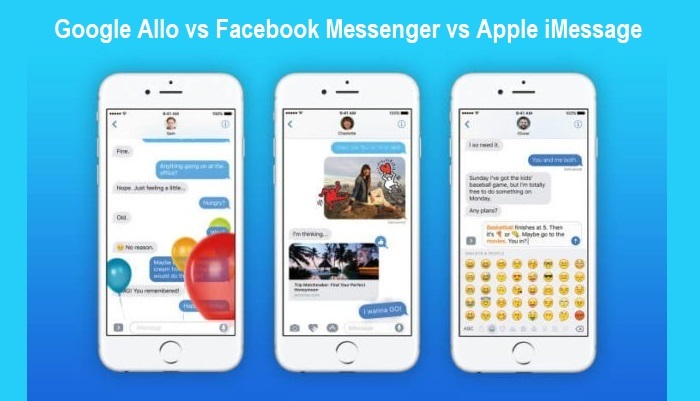 We all have been using Facebook Messenger, Apple iMessage, and Google Allo for quite some time now. And, we all have seen some minor differences in these applications. All these Mobile Apps differ in one way or the other. Initially, all these mobile applications were designed for simple conversations. But, these applications have also evolved and they are no more just a means of conversation. Given below is a quick comparison and differences between these three popular communication apps available for iOS and Android powered smartphones and tablets. This platform was introduced by Facebook in the year 2015. And, Facebook was the first to start its Messenger service. After that, it created chatbots for its application. As of now, there are 30,000 bots on Facebook Messenger. With the help of these bots, users can shop, read the news and do many other things. Each and every bot provides the users with a different experience. Not only bots, even the third-party applications also plug into the Messenger. A number of app integrations have taken place over the past few years making it easy for the customers to use the application. Facebook Messenger is available for Android and iOS. This application can also be used on a desktop. This service is among the largest messaging services in the world. Recently, a new version of iMessage was launched with iOS 10. This version includes all the applications just for Apple’s messaging app. A user can do a number of things with these applications installed within the messaging app. For example, a user can download the Weather channel and look up the forecast or they can choose the restaurant they are planning to go for dinner with their friends. Apple does not limit itself to the only conversation. While using iMessage, a user feels that they are interacting with other applications on the phone, instead of a chatbot. It has also added new stickers which you will not find in the case of Messenger and Allo. The user can also send full-screen animations. This service is only available to Apple users that include iPhone, iPad, iPod touch, and Mac computers. Google Allo has integrated with Google Assistant. This assistant can answer all your questions and can also give you suggestions. Allo helps you to interact with Assistant in two ways. In a first way, you can interact with the help of a message where you just have to type @google followed by your message. In second way, you can directly interact with the Assistant and the assistant will provide you with all the answers. As of now, the Assistant is equipped only to help you with some basic tasks. In case of more complicated questions like that of finding your transportation schedule, you need help of other browsers. Allo does not offer third- party apps, unlike Facebook and Apple. They might do it in future, though. If you are using Allo, you can look for nearby restaurants or theatres. But, if you want to book a table or buy a ticket, Allo will not let you do that.